Beginning in September, the Eden Prairie school board announced new boundaries for the schools. Their rationale and the new boundries are shown in this link. I hear Eden Prairie has great schools, I know people who work and attend there. The primary concern of the board is the concentration of low-income students into one school. One of the elementary schools has 43% of its students eligible for free and reduced lunch, the other three elementary schools have from 9.5% – 23%. The low income students in Eden Prairie are largely comprised of students of color, with a significant number being Latino and East African Immigrants, as well as African Americans. These families are mostly concentrated in a few geographic areas. It appears the board was concerned for all students and explain that the average time for bus rides will remain the same and natural boundaries are being followed. Why would a parent not want the best for all the kids in your community? In the documents linked above, the school sites both social and economic reasons for evening out the economics and in effect the racial diversity in the schools. Diminished property values in the community around its schools. Proactive measures like this boundary change will create the best conditions for success of all of our schools. Dumbing-down the white rich students and decreasing their chances for success in an increasingly diverse world. Increasing the social isolation of low-income students and increasing the possibility they will turn to gangs to fill their social identity needs. Increasing the level of racial and economic tension in the High-School as the students will not have been together in elementary schools and will be more likely to view each other as threats, not as neighbors. Decreasing the property values around the “undesirable schools” Who wants to by a home where the elementary schools are “questionable?” – hence hastening the decline of Eden Prairie as a bastion of wealth and “all-american” values. 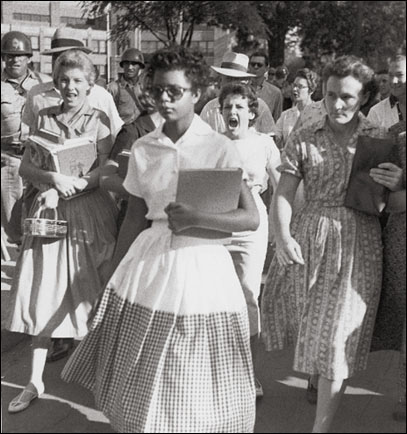 School Integration Begins at Central High School in Little Rock 1957 - Have attitudes changed much? I can understand the angst of some of these parents. I mean they could have bought a lovely $700k on the Minneapolis lakes, avoided the nasty commutes, and sent their kids to integrated schools. True, many people have great and noble reasons for living in communities like EP. (I’m not knocking you if that is your case.). But for others, their decision to spend more and drive further was simply in order to be more isolated (and hopefully safe). And now, here comes “those” people moving right into their community. I know there are lots of strong churches in Eden Prairie, I hope they will soon preach a sermon series on “Welcoming the Stranger, and Loving your Neighbor.” For some reason these ideals rarely get beyond our church doors, into our streets, or even our school board meetings. Welcome and love are not easy to live out, anger and treats are the natural reaction when one’s comfort level is threatened. But, how are we called to live? “…diversity is ok, but I’m going to introduce my kids to it when I want to, I don’t want the government forcing it on me.” Is the passive way of saying I don’t want my kid to be expossed to diversity. The fact is also that when I was going to MPLS public high school I compared the statistics and they were spending over $2,500 a year per student compared to MPLS’ $750. This is another form of discrimination, you keep the poor school less educated and the wealthy ones more educated. Why? Because they have more money. If I have the chance my kid is going to a school like Eden Prarie even if I don’t live in the area. Education is the key to success and it has been too long that we don’t ration it out eaqually. This type of stuff just saddens me. This separation is a reflection of fear and xenophobia… which is not where MN should be at, but it unfortunately is. If we continue to go down this type of route the “fear” will never be dealt with. Folks in the suburbs need to realize that the world’s population has a majority of peoples from Asia and Africa… the world is going to be coming to the Twin Cities… they can keep moving further, but no matter where they go they or another generation of theirs are/is going to be hit with the reality that this world holds a lot of different people. When I hear about how awesome MN schools are, I want to be proud and happy… but honestly we have one of the biggest achievement gaps between students from different socioeconomic and ethnic/racial backgrounds. Sorry but that is not something to be proud of. If we chose to focus on all children/students in MN as OUR children, and not THOSE children/students, I’m know we would all fight to give every person to reach their full potential. If we change our thinking, this state would also go so far, be a leader in education, and be rich in dynamic ways. Anyway thanks for shedding light on the issue Marque! Keep updating your fb w/ your blog updates becuz I usually read them. Wow- I believe you missed the point on why the parents in Eden Prairie are upset about the new boundry issue. Has nothing to do with Race and not sure why you would even make it a racial issue. It has to do with keeping neighborhood schools. As an Eden Prairie Parent, why would I want to subject my child to a 20 minute bus ride twice a day when his current school is 5 minutes away? This is just one issue and the tip of the iceberg but I assure you it isn’t about race. I may be wrong, but as I’ve heard the issue, followed the school board posts, looked at the maps and talked to people from EP – it seems few will get longer rides, some will get shorter, and average rides will stay the same. EP is not that large. Secondly a better question; if you had unexpected guests to your home and you were about to sit down to eat steak, would you be content to just pull out hot dogs for them and demand they only get that, while you and your kids sit across the table with steak sauce running down your face? Most likely not, you would be glad to wait to fix, even go get more steak, or find a way to share – same diff, why would you be content for your neighbors to get less? Dan, I welcome your push back and comments. John, you talk as if you know me personally, refresh my memory on how you have authority to speak so confidently as to my mental condition. I preach and teach quite loudly about “white guilt.” It is NEVER a healthy motivation, it is a desire to bring self-comfort (ease MY guilt) and not from a position of addressing the real-core issues that feed injustice and to help build community. I know changes like this are not easy and I know for many the most basic issue is why do “I” have to make changes. I heard one parent describe this as “forced busing” – but reality is there presently is forced busing as well – it’s just that parents like the schools their kids are being bused to. The point I believe with the district is that this is about assuring ALL kids in EP a great education, at present most get a great education, but if you are in the school with high concentrations of poverty, the education levels often begin to slip. Why? When you have parents with fewer resources to invest in their kids, they often (but not always) need extra assistance. So if they are concentrated in one school it becomes a problem, but if income levels are more evenly distributed there will be more opportunity for all. On the other side, children from wealthier families gain in their education when they are with children from other backgrounds, not only are they more aware of the issues of the world and grateful for what they have, they will graduate more prepared for the diversity of college and the workplace. It is a wealth issue, as I’ve heard parents say their property values may decrease, but the plan of the district is partly designed to assure that the property values in ONE neighborhood do not bottom out (because they are part of that school) and create a “slum” area in the middle of EP. I know not all EP parent upset about the changes have race or class on their minds, they are concerned about another change for their kids. BUT – I have heard / read parents on the news and in posts directly SAY we don’t want out kids going to school with THOSE kids.. if that is not about race / class I don’t know what it is. What Marque and other liberals are unwittingly admitting is that a school with predominately black kids is not capable of reaching the academic levels of a school with predominately black kids. If not, why is it always the whites who have to sacrifice on behalf of the blacks? Why not the other way around? And why is it the government’s job to be involved in this in the first place? If I bought a home in EP, or if I bought a home in the ghetto, then that was my choice. I should live with the consequences. Edit: Third sentence should read “white” kids. There are many schools with all / predominately black students that excel – the issue is poverty and the extra stress factors that it puts on children and families. BUT poverty is highly racialized… and so we wind-up talking about race as well as class. All the children we are talking about live IN Eden Prairie – not other districts..
You are the one who made the discussion racial. And yes, I do use “liberal” as a pejorative — liberalism is morally evil and destructive. John there are many things about Liberalism I do NOT support as with Conservatism. The world is too complex to be divided into 2 easy approaches. But remember in Jesus’ day the conservatives were the Scribes and Pharicees, who wanted to “conserve” the way things were, Jesus was the liberal who wanted to liberate and bring in a new way. Martin Luther and the reformers were the Liberals, and the traditional Catholic rulers were the conservatives. thanks for the diversion John but I’m done with this, I think it is interesting you “like” Atmosphere” and “Rhymesayers” on your facebook but obviously don’t listen to their lyrics. I appreciate your post Marque and the honest push back from other authors. My hope for you all (as is a hope and goal for my students as a high school teacher) is that you would learn to listen and affirm before you defend and speak. I think we need to be careful how we frame issues of school integration. If we frame the issue with a narrow lens of only stating that poor students (often, of “color”) need to be with wealthy students in order to be successful then we start looking at students in poverty from a deficit model which can perpetuate the racism and classism that progressives are trying to fight against. If we however frame things with a wider angle (and more accurate in my viewpoint), we see that oppressive systems and structures (yes my friend, often controlled and maintained by european american males) are the cause for our students underperforming. When students and communities have different access to opportunity, they will have different results in performance when it comes to education. I think this is the unsettling reality of class in the United States. I don’t think we need to be defensive on this point, its a pretty simple equation. A big part of student performance is a reflection of economic class. This does not mean lower class students cannot, it means they need extra help to be able to. Any learner of recent history should be able to understand how the GI Bill, red lining, blockbusting, unequal educational funding based on geographic place, predatory lending etc influences who will likely be in which economic class. A good parent will fight and care for their own children. I believe this is admirable, beautiful, and I affirm you. A good human being however, sees beyond themselves and will fight and care for all our children. And it is then that “those” children become “our” children, we stop blaming, and maybe, we are able to shift from blaming, to solving. And poor Avery is misguided. It is the white liberals who keep the black children from being everything they could be. They give them the stigma of being unable to achieve the way that white children do. White liberals are the worst kind of racists. Brother John, I see some good intentions in your writing. You appear to strongly believe that all children are capable of great things. I affirm you in that belief. It appears that you may not have read that I said ” This does not mean lower class students cannot, it means they need extra help to be able to”. Let me explain a little bit more of what I meant by that. As a current student of language acquisition, I have found it interesting to note that the economic class of a family often has high correlations with the depth and breathe of a child’s vocabulary. Those who grow up in homes with highly educated educated parents (which often correlated with our class privilege) will often have a larger vocabulary. I think most of us could understand why this might be. Those who grow up in homes whose parents may be working 2 jobs, the second and third shift, may not have english as our home language, or have parents with lesser degrees of formal education will not be exposed to as rich a language environment in our formative years (specifically when referring to English vocabulary). This vocabulary gap follows students into elementary school (which is often a gap of thousands of words) and continues to grow until students graduate from high school. Our students ability to pass both the MCA reading and writing test (9th and 10th grade) are heavily influenced by the depth and breathe of their vocabulary. This does not say anything bad about the parents, communities, or people groups, but says everything about how class (wealth) and access to opportunity often affects our children. It is because of things like this that I believe students in disadvantaged areas need more help and support so we can have a more equal result for all our students. I define educational equity not as treating everyone equally, but treating everyone in such a way that all our students can have a high quality result. Some students need extra support to be successful while others need less. I don’t think this to be a provocative statement. I hope that helps to elaborate my position. I disagree with your assertion that I am misguided. My statements and opinions have been formulated over the past years through research and study at both conservative institutions (Northwestern College, St. Paul) and liberal institutions (Hamline University). While I affirm your ability to state your opinion, I would assert that it is not liberals nor conservatives that “keep black children from learning”, but rather those of us who demonize the opposing viewpoint, often fail to use the social sciences to for solving social problems, and in doing so, view these conversations a-historically. It appears you assumed I am a white liberal. Do you know me or were you assuming this to be true? You stated that “white liberals are the worse kinds of racists” and seem to have a strong distain to those of the opposing viewpoint. Why do you perceive white liberals in this way ? I appreciate you honesty, and affirm your humanity while finding the majority of your arguments to be disagreeable. I appreciate your kind words and apparent honest struggle with how the many structures of privilege/oppression have affected your current position and understanding of society. I also affirm your point of outrage. Those who have been oppressed historically (which we are simplistically referring to as “the blacks” in this conversation…) have been sacrificing for white empire and privilege for centuries. Call me misguided, but I don’t think it is that much of a stretch for those who have had something stolen from them to demand that it be given back. In this case we are talking about opportunity and education. Continue growing in how these structures affect us, fighting for simple honesty, and pushing others to do the same. Peace be with you friend. Thank you so much for taking the time to thoughtfully formulate your responses and in doing so provide a great educational tool, in many aspects. I have been recommending this posting to a number of people who care about this topic or who are misguided, not only because of the content of the article but especially because of this informative discussion. So again, thanks so much I really appreciate comments. John – Why is it that when someone who has an opinion like Marque that has to do with race you call it “white guilt” you called “Liberalism” evil and immoral but you’re just labeling a group of people you know little about. You sound like an upset EP parent or having some link to it, but your children or the ones you care about go to a public school if that is the case. A well funded public school at that. Key word “PUBLIC.” The children there have 3 times the money put towards them then children in Minneapolis schools have. The same school system I grew up in and completely unprepared me and my classmates for college. Doesn’t sound like equal opportunity to me. They don’t even teach how to do the simple things like cite a paper, or at least they didn’t when I went. It is a race thing, a class things, and an economic thing. You call it “white guilt” well how about calling it “redlining” since we are going to name it. Pizza places don’t deliver to North Minneapolis after dark, and it takes on average 30 minutes for police to show up after being called. Do you deal with these issues? Because I have. How are we supposed to have pride in our neighborhoods if the city doesn’t show pride in our school systems. I said it before I’ll send my kid to your school district if they let me. And keep calling people like me and Marque “Liberals” having “White Guilt” and other terms that seperate us and try to like Marque says “make us sound wrong” before you even listen to us. But you’ll never hear us call you anything that puts you in a box. Stereotyping is going to keep us from ever accomplishing anything in this world and this discussion.